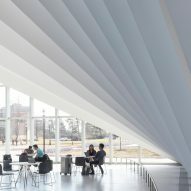 BIG teamed with Boston firm Goody Clancy, which served as the architect of record to design the extension for the college's Isenberg School of Management. 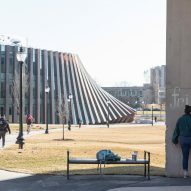 The 70,000-square-foot (6,503-square-metre) Business Innovation Hub accompanies the original Isenberg building, which was completed in 1964, to provide a flexible space for students and faculty. 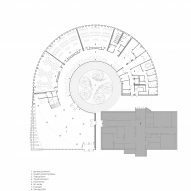 Sited on the campus' Haigis Mall, the round addition extends in a circle from the north and eastern facades of the existing rectangular building, and wraps around a courtyard. 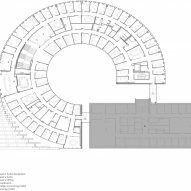 "The new Business Innovation Hub at the Isenberg School of Management is conceived as an extension of both the building and the campus mall," said BIG founder Bjarke Ingels in a project statement. 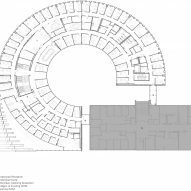 "The linear structure is bent to form a full loop framing an internal courtyard for the life of the students." 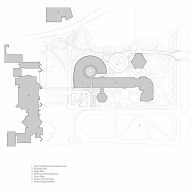 BIG designed the fanned design to continue this link between the mall with activities in the hub. 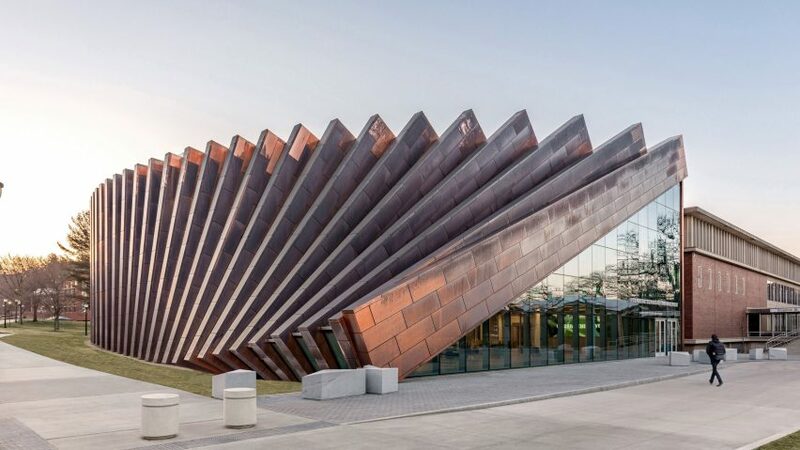 The facade comprises thick copper slats and windows, which gradually slope from dramatic angles to an upright position. "The facade is pulled away in a domino effect to create a generous invitation from the Haigis Mall to the Learning Commons," Ingels added. 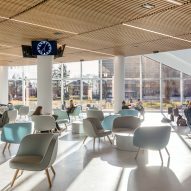 "The mall and the courtyard – inside and outside form a forum for the students, the faculty and the profession to meet, mingle and mix society and academia." Inside, the dramatic slanting roofline forms a feature of the 5,000-square foot (464.5-square-metre) ground floor common area. The slatted facade and white finishes also create bright and airy space. When coupled with the glazing provided by the internal garden, almost all of the rooms within the building receive natural light. The three-storey Business Innovation Hub comprises a mix collaborative study and social area that nearly doubles the school's previous offering. The new volume accommodates more than 150 staff and 5,000 students at UMass. 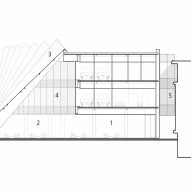 Additional work areas are located in the upper two floors, which feature bridges to the existing business school. The top level also accommodates the dean's office and a boardroom. 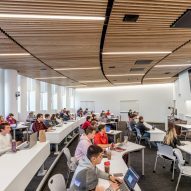 "As a top business school, we want to offer our students, faculty and staff an environment that inspires creativity, communication, innovation and collaboration – a physical space designed to train and prepare students for careers in the 21st century," said Isenberg School of Management's interim dean Tom Moliterno. The Business Innovation Hub follows a slew of new works by BIG – the architecture firm Ingels established in 2006. Also this month, the studio unveiled plans to create floating villages and a park-covered highway in Brooklyn. Photography is by Max Touhey unless stated otherwise.